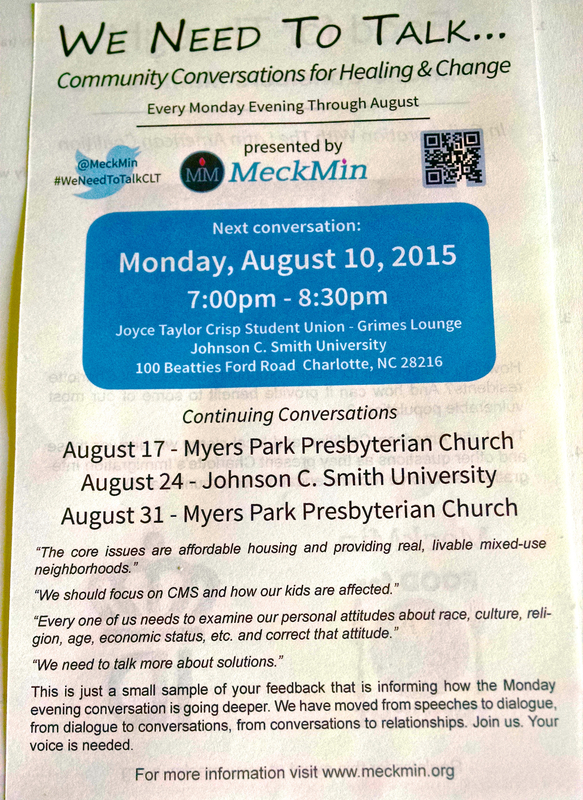 Next week: City of Charlotte Mayoral candidates. Sarah Stevenson thanked those who donated toward the Sarah B. Stevenson South African Students Fund. Two students arrive Sunday. More information will be available in coming days at the fund website. Sean Gautam announced that We Walk Together will walk from First Baptist Church-West to Johnson C. Smith University and back, beginning at 7:30 a.m. on Thursday, Aug. 6. Event is part of a planned 100 miles “to promote peace, understanding and unity in Charlotte’s many diverse communities and neighborhoods.” More on group by e-mail or phone 704-517-5744 or on Facebook. Carlenia Ivory announced that Ivory Baker Center Facility Manager Terence McMurray was back from Florida with the 18 young men playing for the Metrolina Havoc Basketball Club. The club placed first among 75 teams in a basketball competition. Larken Egleston announced that the Young Democrats of N.C. and Young Dems of Mecklenburg County will hold a Gantt-Watt reception on Saturday, Aug. 8 from 7-10 p.m. at Oak Room, 200 E. Bland St. Tickets and details here. Stacy Guinn announced a town hall with At-large City Council candidate Mo Idlibby on Tuesday, Aug. 25 at 5:30 p.m. at Carole Hoefener Center, 610 E. 7th St.
Levester Flowers announced that Reid Park parents would have an opportunity to discuss issues with their students at the kick-off for his school board campaign on Sunday Aug. 16 from 4-6 p.m. at Wilmore Community Center, 501 West Blvd. Palm card here. Mary McCray announced that the CMS school board policy committee would next discuss student assignment at its meeting Thursday, Aug. 13 at 10:30 a.m. at the Government Center. She urged people to press legislators to approve a budget that allows CMS to keep teacher assistants in classrooms. Video here. Thornton Howard III announced a way to help students approach the new school year. Video here. Charles Robinson announced that Team TRUBLUE (Together Reunited Under Brotherly Love Until Eternity), a stop-the-violence nonprofit, would hold a bookbag giveaway on Aug. 8 at The Retreat at Renaissance, the old Boulevard Homes site, at 3240 New Renaissaice Way. Donations may be delivered to Cosmopolitan Community Church, 2600 Newland Rd. Inquiries by e-mail. Carrie Cook announced that the OneMeck coalition on revising student assignment to “ensure educational attainment of every one of our students” will next meet on Monday, Aug. 10 at 7 p.m. at Covenant Presbyterian Church, 100 E. Morehead St.
John F. Wall sent in an announcement that the Hidden Valley neighborhood will participate in the 12th National NightOut event on Tuesday, Aug. 4 from 4-8 p.m. at Tom Hunter Park on Tom Hunter Road. Dena Diorio sent in a copy of her Aug. 3 Board Bulletin. Beth Pickering sent in an announcement of the next “We Need to Talk” session on Monday, Aug. 10 at 7 p.m. in Johnson C. Smith University’s Student Union, 100 Beatties Ford Rd. Flier here. Sharon Holm sent in an announcement of a Gantt After Dark event on Thursday, Aug. 20 at 6 p.m. Details here. Delores Hurt sent in an announcement that Suzanne Reynolds, first female dean of the Wake Forest University School of Law, will keynote the League of Women Voters Elizabeth Hair Memorial Women Equality Day event on Wednesday, Aug. 26 at 6:30 pm. at 1817 Midwood Ave. Details here. Sharon Holm sent in an announcement that Cornel West will headline the 3rd Annual Gantt Symposium on Thursday, Sept. 17 at 7 p.m. at the Knight Theater, 430 S. Tryon St. Details here. Tickets here. Pat Cotham sent in an announcement that the Uptown Democratic Forum will hear from Charlotte mayoral candidates Wednesday, Aug. 19 and at-large City Council candidates on Thursday, Sept. 10. Colette Forrest sent in a media release and a participant guide for Black Philanthropy Month. Robert Dawkins sent in an announcement that summer volunteer Christo Waters had designed a new website for SAFE Coalition NC. Shawn Greeson sent in an announcement that he, family and friends will participate in a stream cleanup on Little Sugar Creek near Levine Children’s Hospital on Saturday, Aug. 8 from 9-11 a.m. Free parking in Lot A.
Charles Thomas sent in an announcement that Don Quixote the llama will greet attendees at ImpactU Demo Day on Wednesday, Aug. 5 at 5 p.m. at UNCC Center City. “Why a llama? You’ll just have to come to Demo Day and find out for yourself.” Details here. Jane Whitley sent in an announcement of the annual Doris Cromartie Fundraiser Gala honoring former U.S. Attorney Anne Tompkins, on Thursday, Aug. 20 from 5:30-8:30 p.m. at Carolina Golf Club, 2415 Old Steele Creek Rd. Details here. Joyce Waddell sent in her July Waddell Bulletin. Sylvia Grier sent in an announcement of “Bridging the Gap Between Employement and Disability,” a forum on employment options for individuals with disabilities, on Tuesday, Aug. 18 at 8:30 a.m. at Partners Behavioral Health Auditorium, 901 S. New Hope Rd. Gastonia. Details here. Rob Hillman sent in an announcement that the Pi Phi Chapter of Omega Psi Phi Fraternity, Inc. will host its annual free candidate forum and BBQ on Saturday, Oct. 17 at 3301 Statesville Ave. from noon-2 p.m.